I had some leftover Kimchi seasoning paste that I made cabbage kimchi with. I also had a packet of slightly salted yellow croakers in my freezer that I need to rescue for the good use. 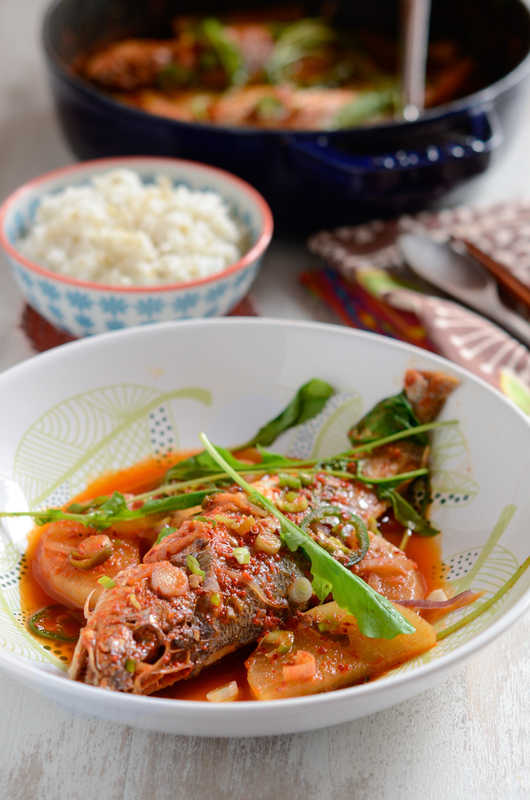 So here is, the spicy yellow croaker fish stew~! 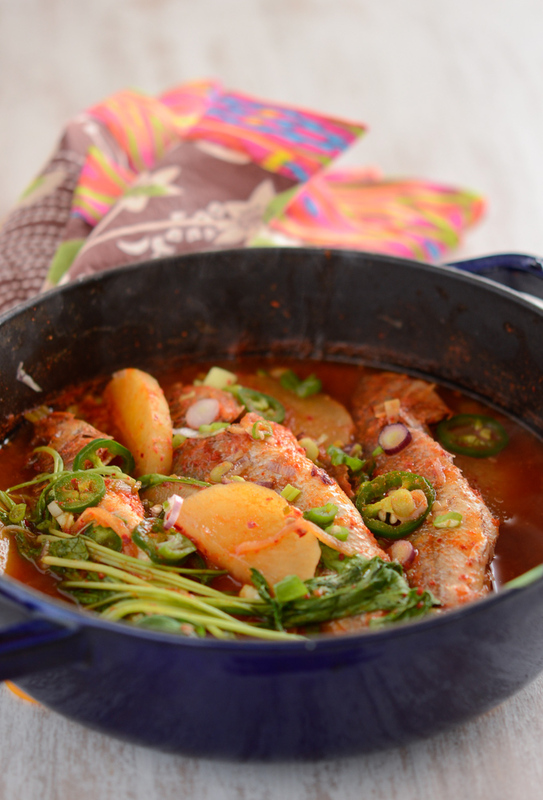 Any kind of spicy fish or seafood stews in Korean is called Mae Un Tang (매운탕). 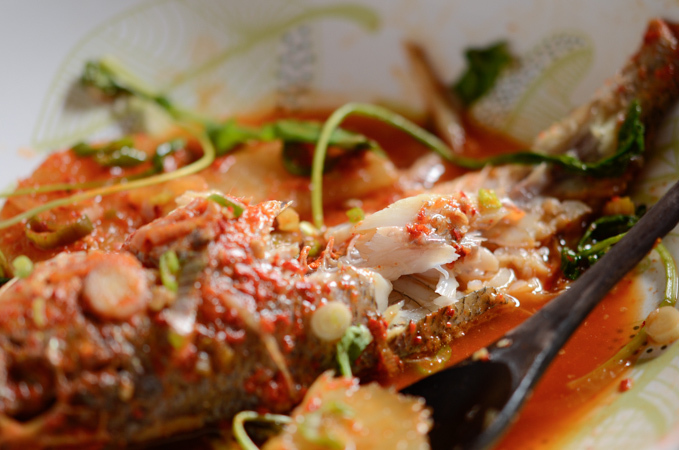 I used yellow croakers for this dish and this spicy yellow croaker fish stew is called jogi-maeun-tang (조기매운탕). 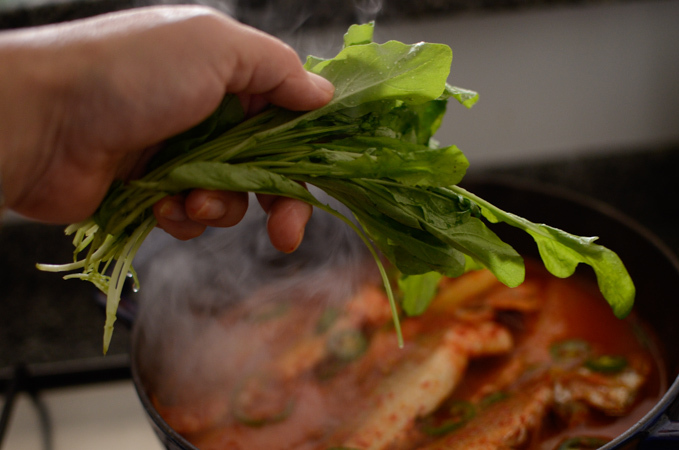 The Kimchi seasoning paste includes most of the necessary ingredients that are used in traditional Maeun-tang so that you don’t need to make the sauce separately. 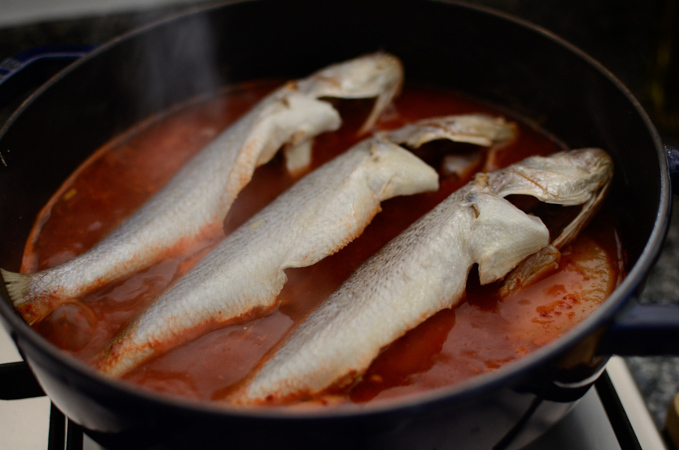 The fish sauce included in the paste will eliminate the step of making anchovy stock for the stew, and it makes cooking so much more easy and fast. 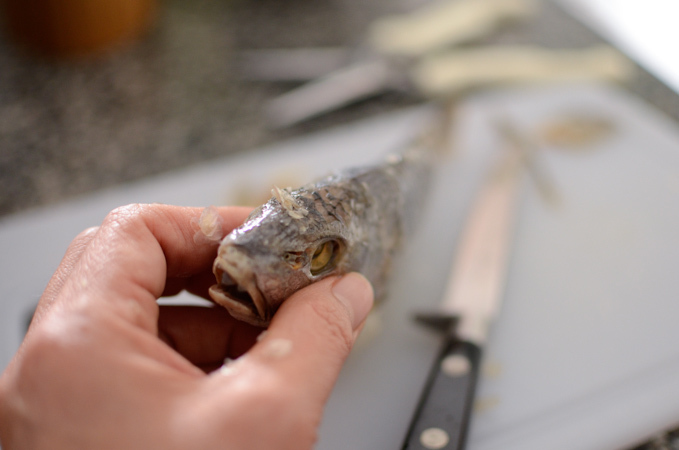 The trick to make the fish less odorous when cooking, you will need to clean them very well. 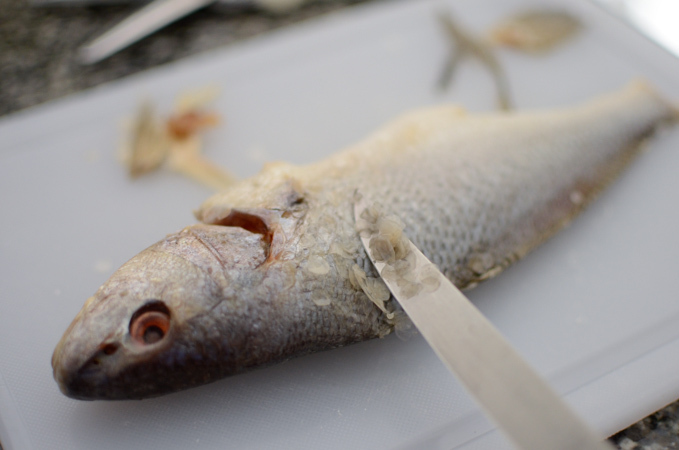 No matter you purchase the pre-cleaned fish, there always be a need to do some extra cleaning work. I will show you how to do it. Here are the 5 yellow Croaker guys. I will only use 3 of them and keel the other 2 to broil for my son who is not so used to the spicy stew. They are slightly salted and supposedly cleaned. We’ll see. You can use fresh croake instead if you can’t find the salted ones. It will taste even better. Cut off all the fins and tail. They don’t bring any good tidings to the stew. 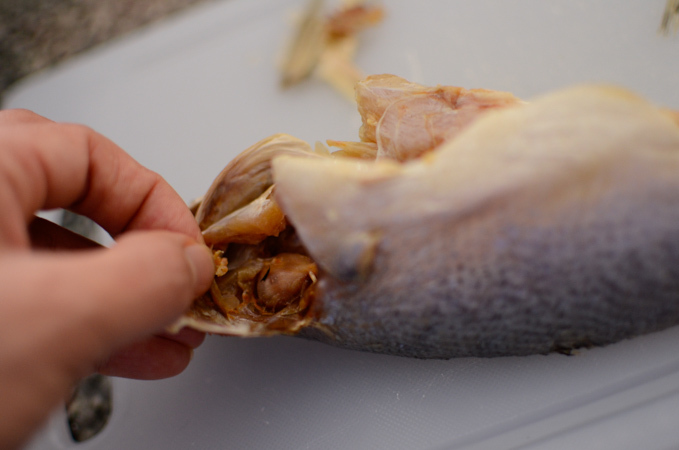 Check the gill and the stomach to make sure all the gunky stuff is removed. Scrape off the scales. Usually they only remove the scales from the body part, but not toward the head. You will need to remove all the scales. 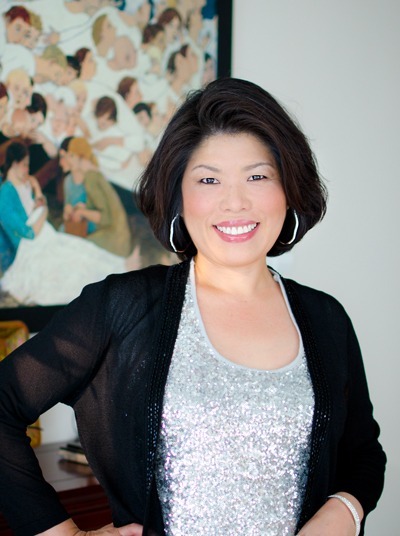 They are the one that cause the bad fish odor. Well, well, well…, this guy doesn’t seem to be happy with me. Rinse well and set aside. They all look sleek and gorgeous, right? Dice a small radish into 3/8-inch thick slices. Boil and simmer the radish slices and a piece of dried sea kelp in the water for a few minutes until the radishes are somewhat tender. You will need to remove the sea kelp in the middle. Here is the leftover kimchi seasoning paste. 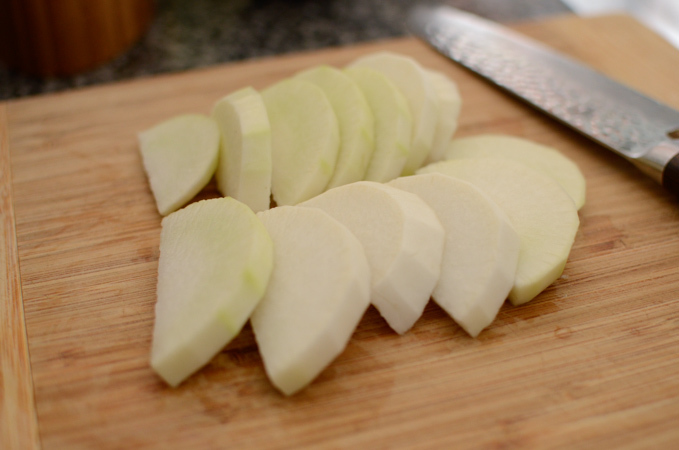 When the radishes are tender, add the seasoning to the pot, about 3-4 tablespoons or depends on how much you like. 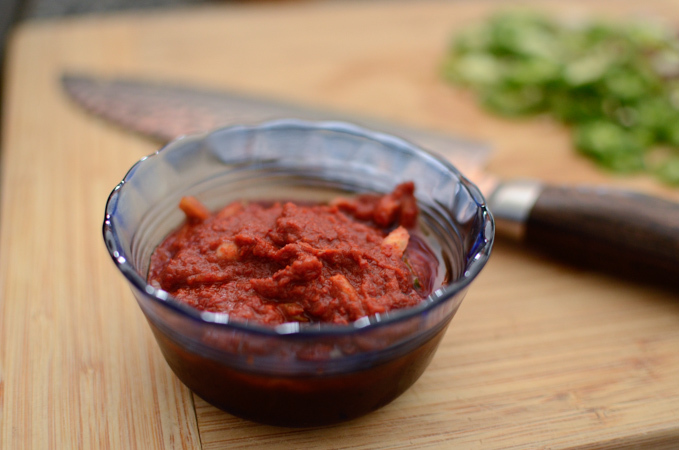 And a little bit (about 1 teaspoon) of Korean soybean paste. 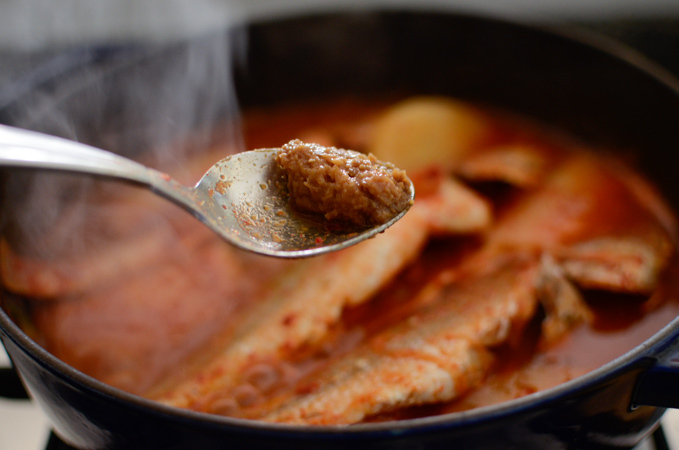 This will help to get rid of any remaining fish odor in the stew. Bring the whole thing to a boil and cook for 3-5 minutes. Taste the broth and season with Korean soy sauce for soup according to your taste. At last, add some sliced fresh green chili and cook for 1 more minute. Remove the pot from heat and add chopped green onion and a small bunch of arugula. Don’t skip the arugula. It really adds nice touch to the stew. The stew is ready. I know if you are not a fish person, this won’t look appetizing at all. 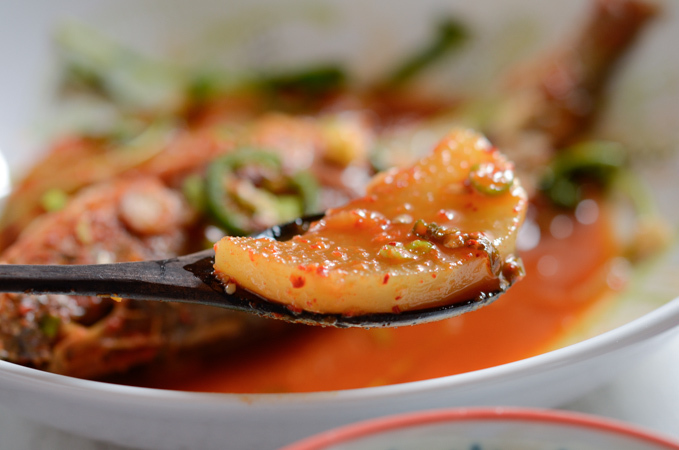 But to most Koreans or sincere Korean food lovers, this kind of spicy fish stew is motherly comforting. This is how we enjoy the fish stew in Korea. So yummy~! 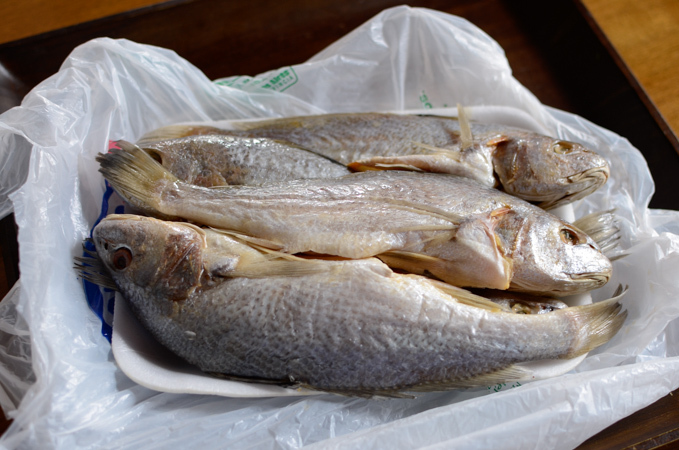 If you like fishes and also loves spiciness, try to get hold of yellow croakers. They don’t have to be salted. 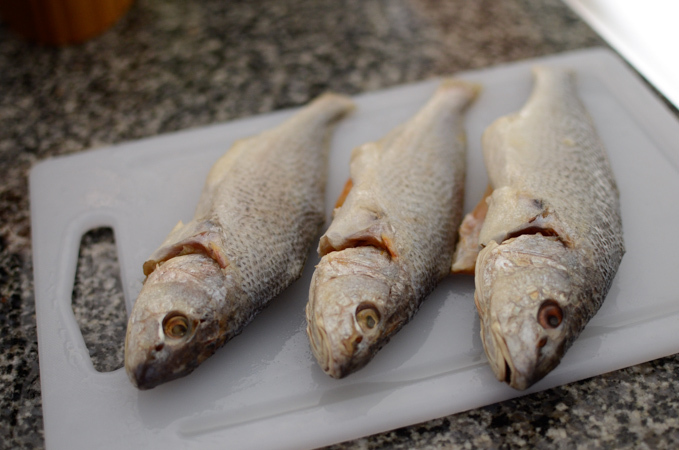 Fresh croakers are just fine to use for this recipe. 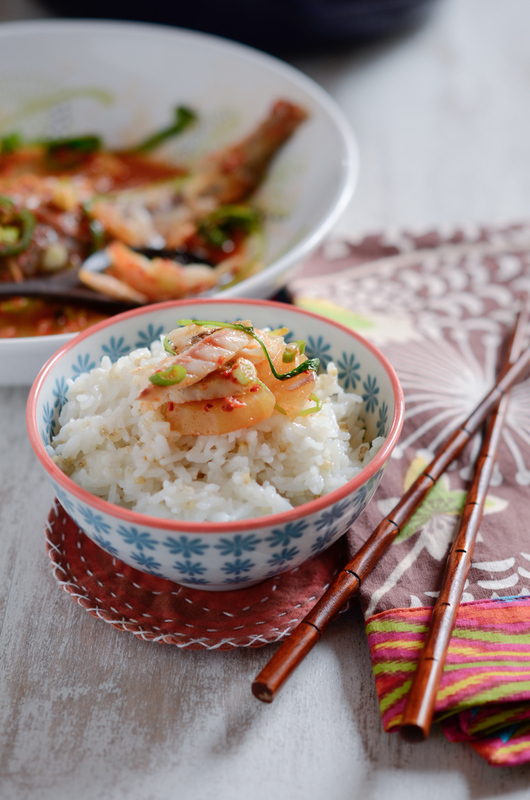 Hope you give this Korean fish stew a try. It is GOOD! 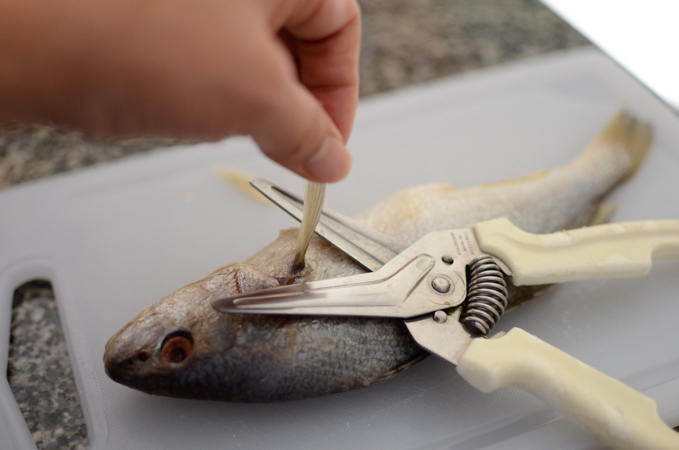 Clean the fish by removing all the fins, tails, and scales from the body and head. Rinse well and set aside. 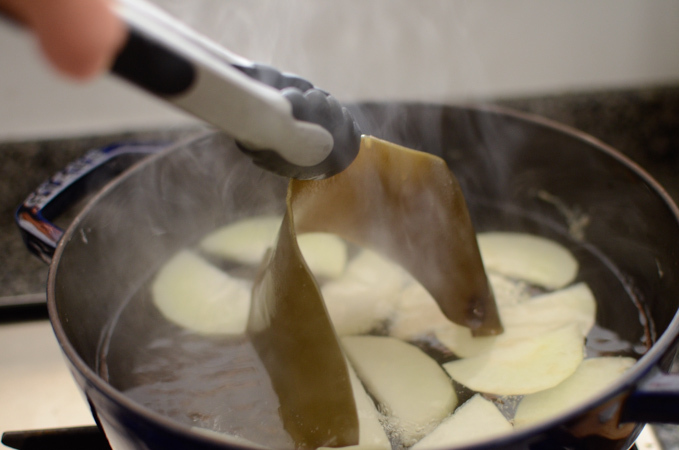 In a pot combine radish slices, sea kelp and water and bring to boil. Simmer for 3-5 minute until radishes are somewhat tender. Remove the sea kelp. 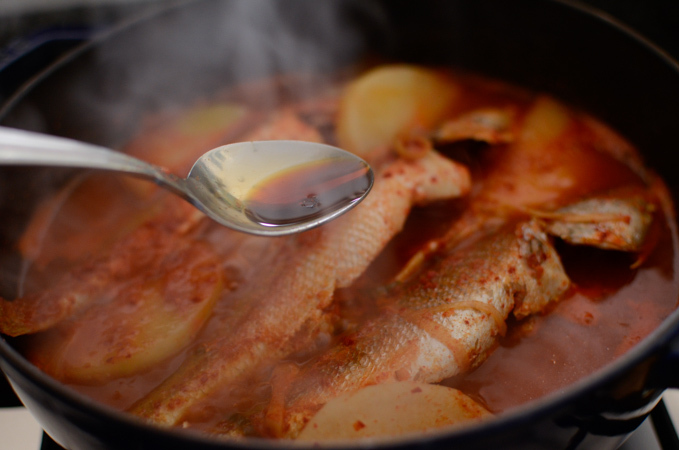 Add the fish and the kimchi seasoning paste to the pot. 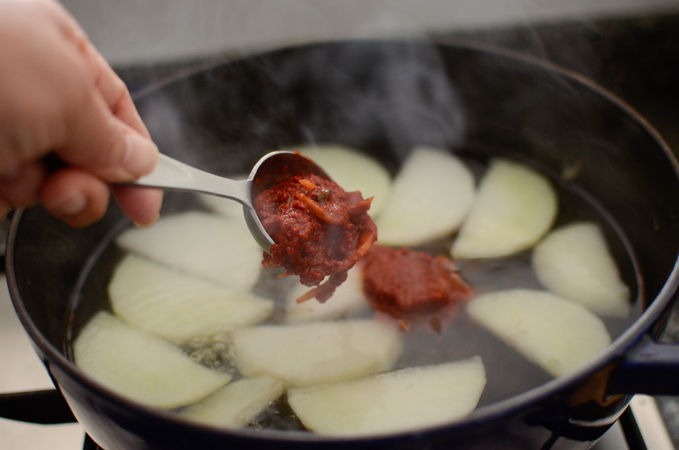 Smear the Korean soybean paste to incorporate to the broth. Boil the stew over medium heat for 4-5 minutes or until fishes are cooked and the radishes are tender, spooning up the broth over the fish occasionally. Taste the broth and season with the Korean soy sauce for soup according to your taste. Add the slices chili at last and cook for 1 more minute. Remove the pot from the heat and add the green onion and the arugula at last. Serve hot with rice. After reading through the recipe I know I will love this dish. 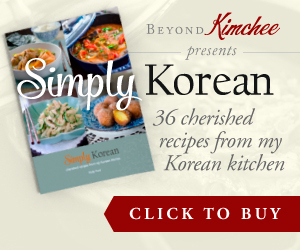 Will make it when I have some kimchee seasonings.